They said it was impossible is series of four Bible studies. Study 1 is titled “They said it was impossible”. The Bible study is designed for individual and group use and can be downloaded to a computer, laptop, tablet or Smartphone. 1The Lord had said to Abram, “Go from your country, your people and your father’s household to the land I will show you. “They said it was impossible” is the first study in a series of four multimedia Bible studies. In Genesis 12 we learn Abraham was 75 years old when called by God to leave Harran. In Genesis 17 we read Abraham was 100 years old when Isaac was conceived and Abraham and Sarah had waited 25 years for God to fulfil his promise to bless them. 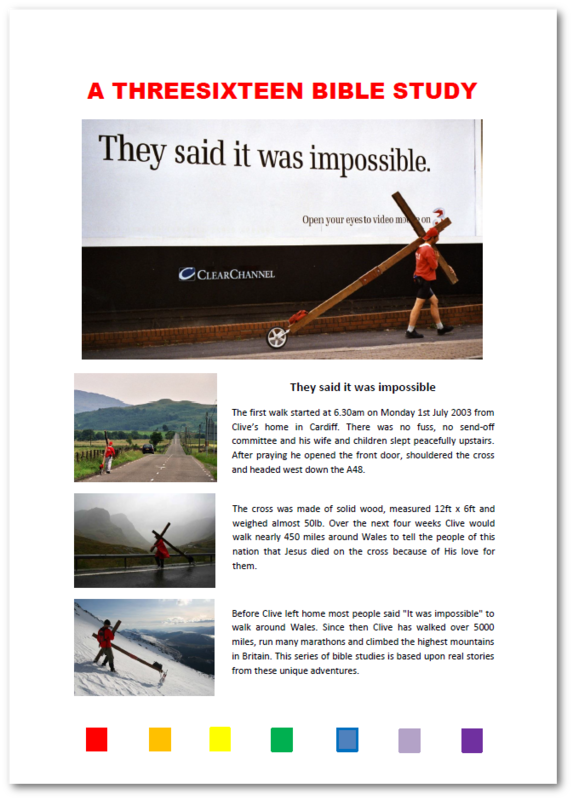 In the short video “They said it was impossible” we hear it was almost 14 years between God informing Clive he would walk with the cross and the start of the first walk around Wales. We learn when Clive announced he was going to walk with the cross many of his friends and family told him it was impossible. When Sarah was told she was going to bear a child she herself laughed in disbelief. After 25 years waiting she must have thought it would never happen. In this study we explore Genesis 17 and 18 and look at Isaac’s promised birth, how Abraham and Sarah reacted to God’s promise of the impossible and consider what this may mean for us today.